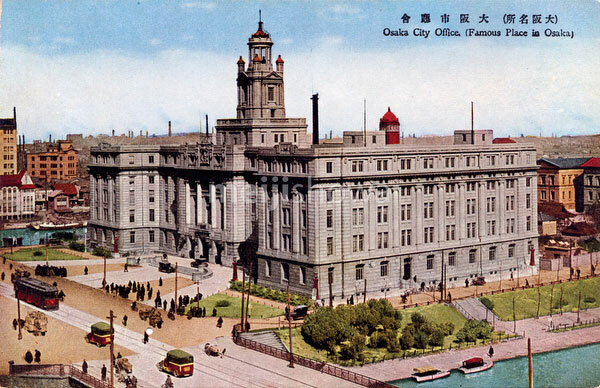 A streetcar and two taxis pass in front of Osaka City Hall in Nakanoshima, Osaka. Built between 1918 (Taisho 7) and 1921 (Taisho 10), it was designed by representative Meiji Era architects like Yasushi Kataoka, Hikotaro Imabayashi and others, who followed an original design by Yokichi Ogawa. Starting in 1982 (Showa 57) it was gradually torn down and in 1986 (Showa 61) it was replaced by a modern building.